Scents of Cedar B&B sits nestled on 5.5 wooded acres in historic Prince George County, Virginia. The location is rich in history and in southern hospitality. The complete interior of the B&B is cedar logs and we enjoy sharing the details and challenges of building a log home and our custom design for our indoor Out House. Three gracious guest rooms inside the main house invite you to relax and be pampered. In The Loft, Guest Room One features a queen size bed. The cedar logs are adorned with needlework of Amish farm land. Adjacent to Guest Room One is a private bath which includes a cast iron claw foot tub and shower. Also in The Loft, Guest Room Two features a queen size bed. Making your way downstairs on a spiral staircase, Guest Room Three features a queen size oak sleigh bed and is decorated with a theme of Labrador retrievers. The private bath has a shower and a tub. Additionally, The Cabin In The Woods is a great spot for that romantic get-away. 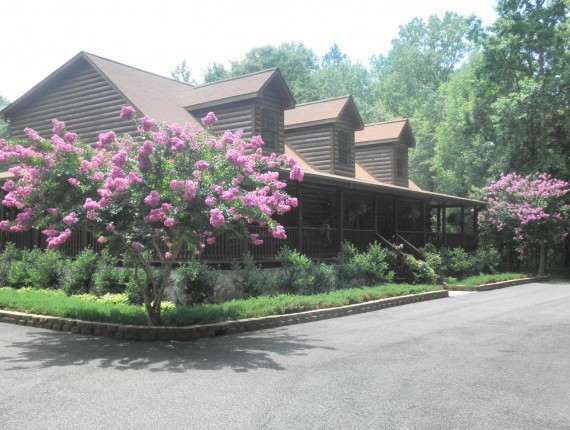 The Cabin is secluded on the back part of the property overlooking the pond. The only interruption you may have is the soothing sound of the fountain and the harmony of the evening bull frogs. The Cabin is a 12’ x 24′, one room guest house. It is air conditioned and has a queen size bed, bathroom with shower, refrigerator, microwave, coffee pot and toaster. Our guests in The Cabin may also choose to have their breakfast delivered in lieu of coming to the main house. There is also a sitting area with TV and DVD player. Enjoy fishing or just sitting on the porch rocking until sunset. The Cabin also has a gas grill for those who enjoy cooking outdoors. A circular gravel path around the pond is great for casual walks in the evening. There’s something truly relaxing about feeding the fish. Fishing poles are also available. The pond is stocked with catfish and small mouth bass. Please honor our catch and release policy. There are also picnic tables available. The exterior of the B&B features an 18′ x 36′ in-ground swimming pool. The pool is open from Memorial Day through Labor Day. Life doesn’t get any better than enjoying a cool swim on a hot Virginia summer night. Most evenings, the crickets will sing to keep you company. Our 24′ x 24′ Pool House has a stone gas log fireplace which can be enjoyed by our guests in the cooler fall months. The Pool House also has a full bath. Adjacent to the pond is a 23′ x 39′ foot covered Barn which provides a wonderful rustic venue for weddings or other small events. There is no smoking permitted indoors and smoking outdoors is limited to designated areas. Our B&B is not handicapped accessible. We are not able to accommodate pets. Indoors and outdoors, Scents of Cedar is a great spot for small group social events such as a Church Fund Raiser, a retreat for small groups, or an outdoor wedding. If you’re a racing fan and need a place to pit for a night, join us at Scents of Cedar. We are located approximately 30-45 minutes south from the Richmond International Raceway and approximately 30 minutes away from Virginia Motorsport Park in Dinwiddie, Virginia. For the wine lovers, we are approximately 30 minutes south of James River Cellars in Richmond,VA and 45 minutes east of New Kent Winery.